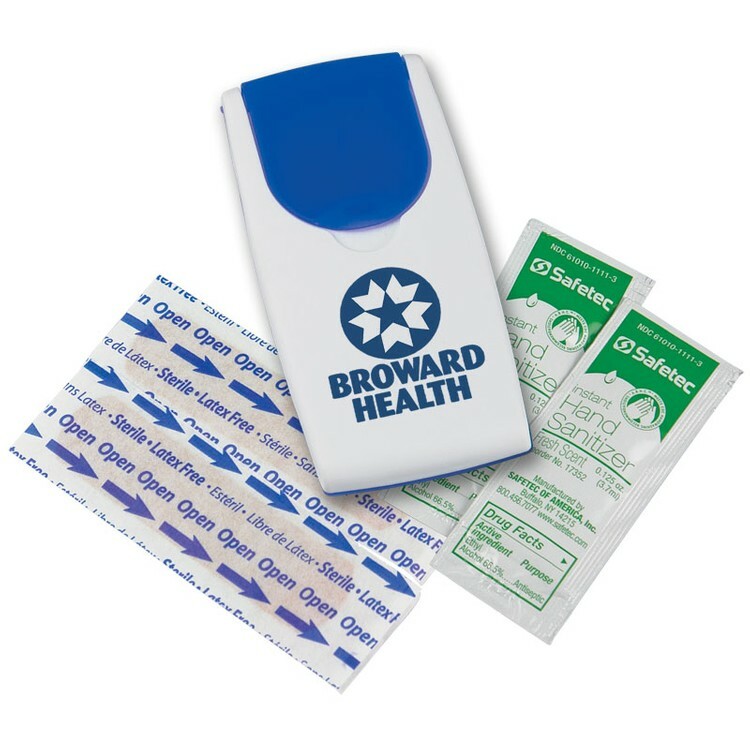 Contoured living hinge case - Contains One sunscreen packet one Blistex packet and one moist towelette. Price includes one color imprint. 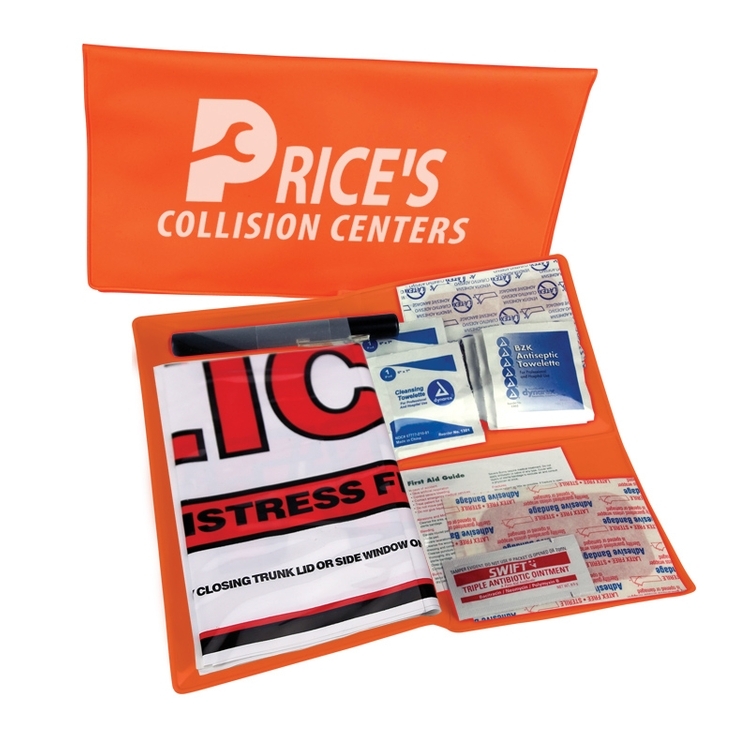 Vinyl case contains *key light with battery, distress flag, road atlas, *tire gauge, two wash up towelettes, three antiseptic towelettes, four adhesive bandages, extra large bandage, triple antibiotic ointment and first aid guide. Price includes one color one side imprint. 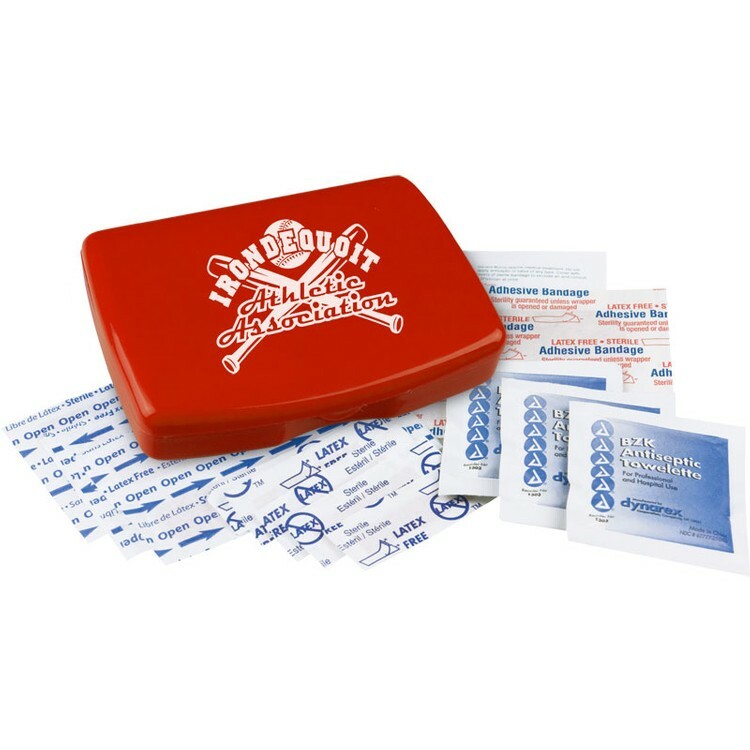 Durable living hinge box contains four adhesive bandages non aspirin pain reliever two antiseptic towelettes and first aid card. Price includes one color imprint. Cylindrical floating container includes one sunscreen packet and two Blistex. Price includes one color imprint second side or wrap imprint at no extra charge. 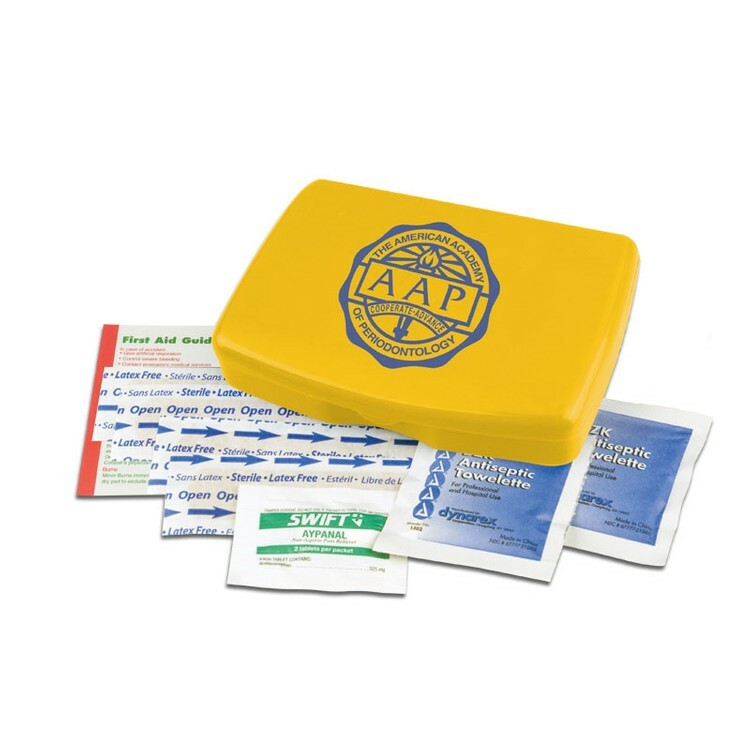 Contains four bandages first aid guide non-aspirin pain reliever twinpack two antiseptic towelettes antacid. 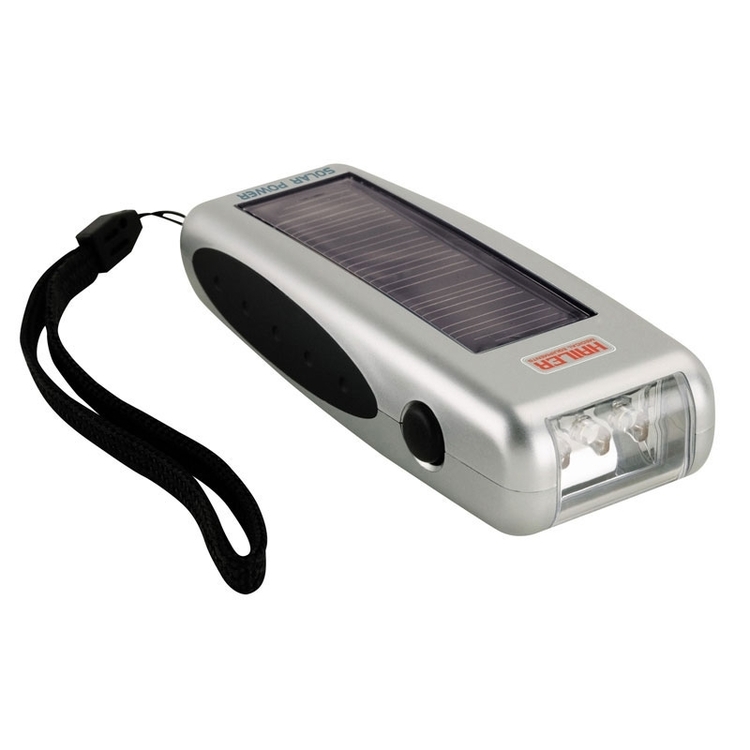 Price includes one color imprint one side imprint. 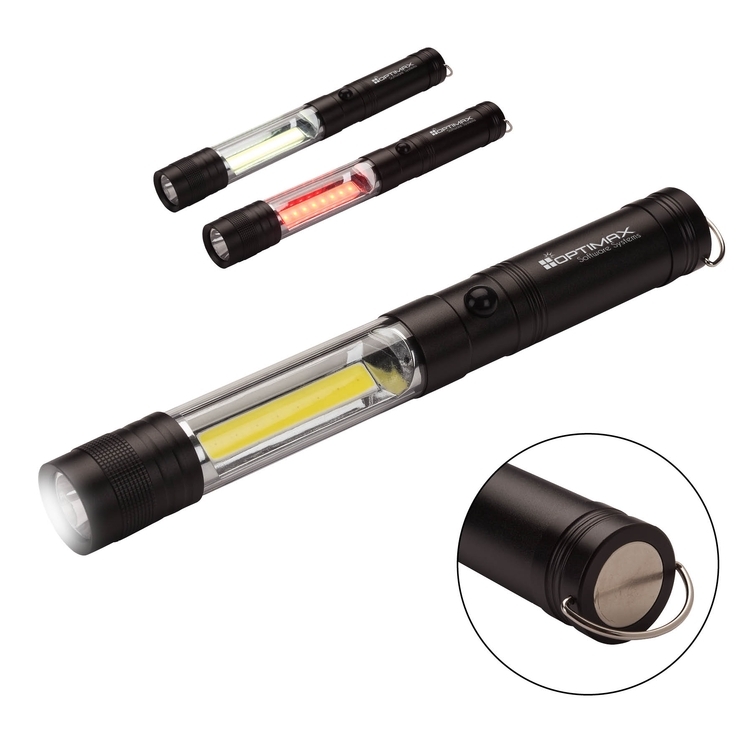 Use the Expedition Multi-Tool to spread your branding message! 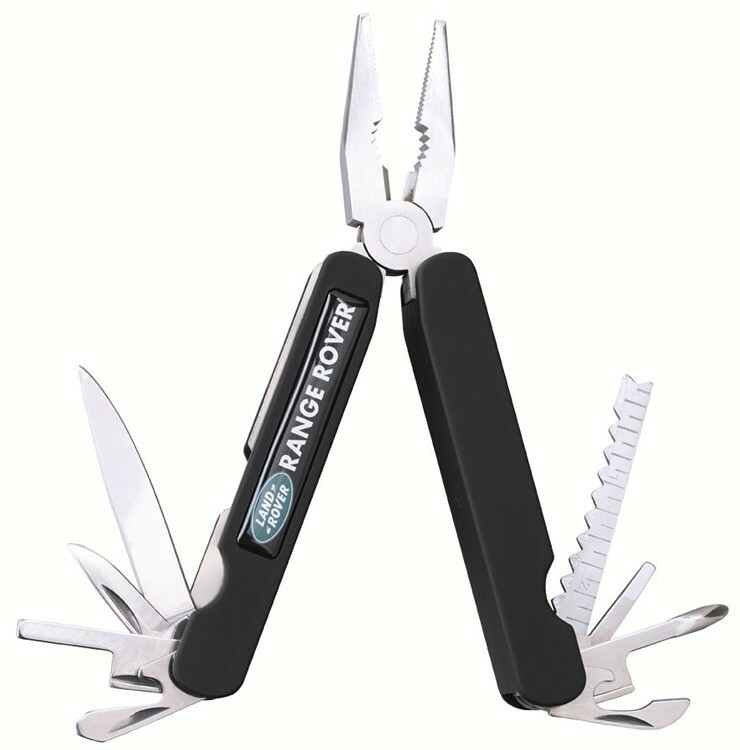 It includes needle-nose pliers, a bottle opener, a mini saw, a large knife, a ruler, a can opener, a wire cutter, a small knife, a Phillips screwdriver, a small flat head screw driver, a medium flat head screwdriver and a large flat head screwdriver. It comes with a carry pouch with belt loop. 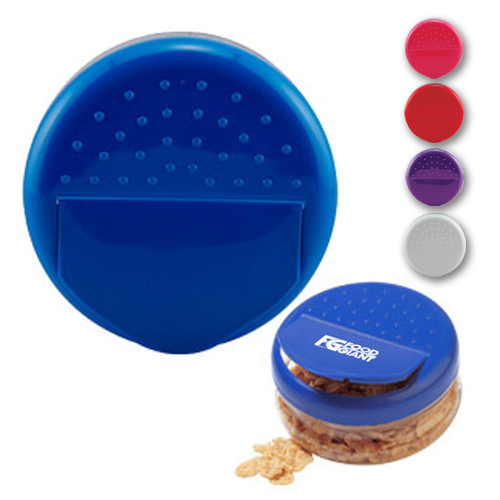 The exclusive N-Dome imprint includes up to a four color process imprint on your choice of background color. The permanent, rich print won't wear, wash or scratch off. Get your logo noticed! Express Office Kit Contains lens cleaner computer screen cleaner two adhesive bandages non-aspirin pain reliever packet antacid packet two wash-up towelettes. Price includes one color imprint. 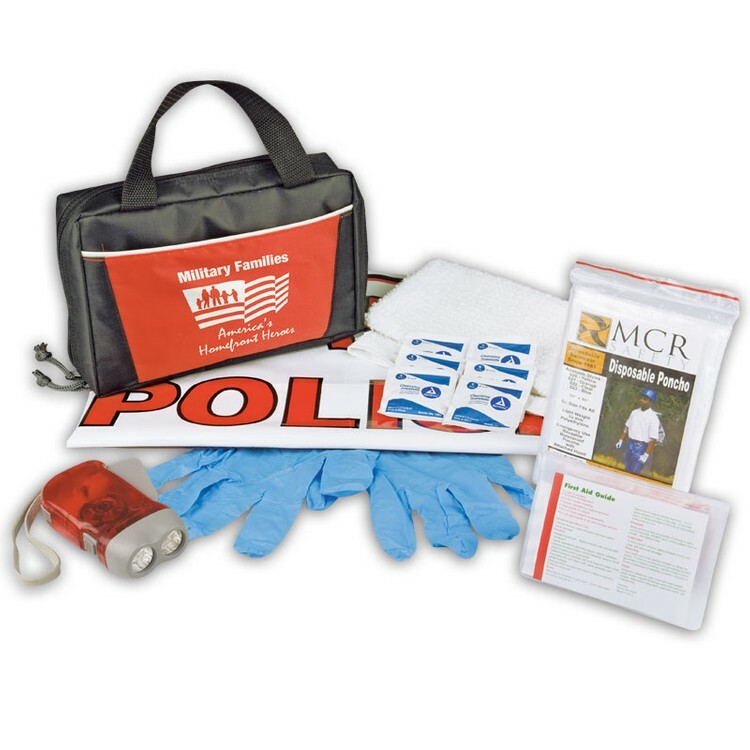 Premium polyester Zipper Tote with handle & front pocket includes a Hand-powered Flashlight (FL4CR) Distress Flag, Rain Poncho, Six Wash-up Towelettes, Shop Cloth, One pair of nitrile Gloves and 19 piece first aid kit. 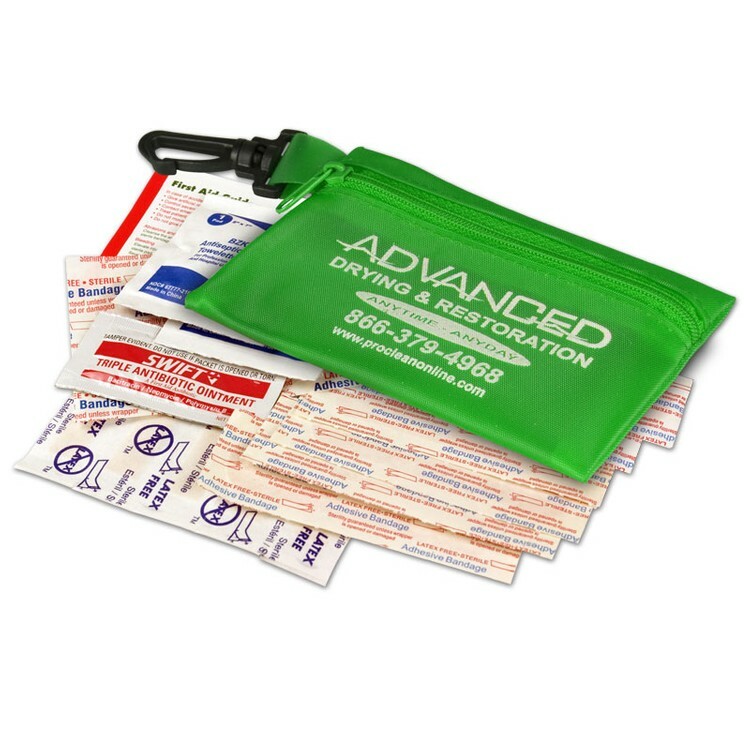 Slim, convenient flip top first aid kits are compact and excellent for trade show giveaways. 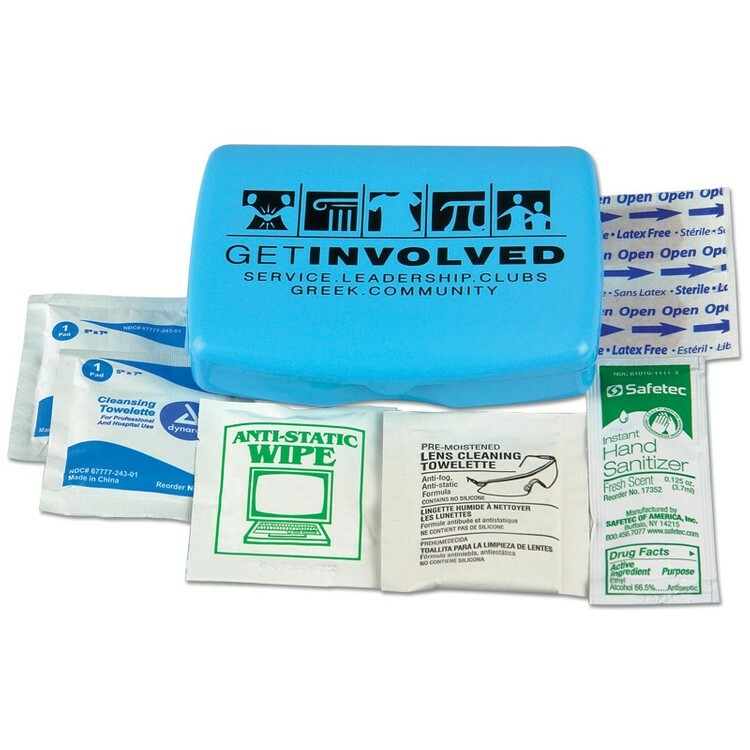 Contains three adhesive bandages and two small hand sanitizer packets. 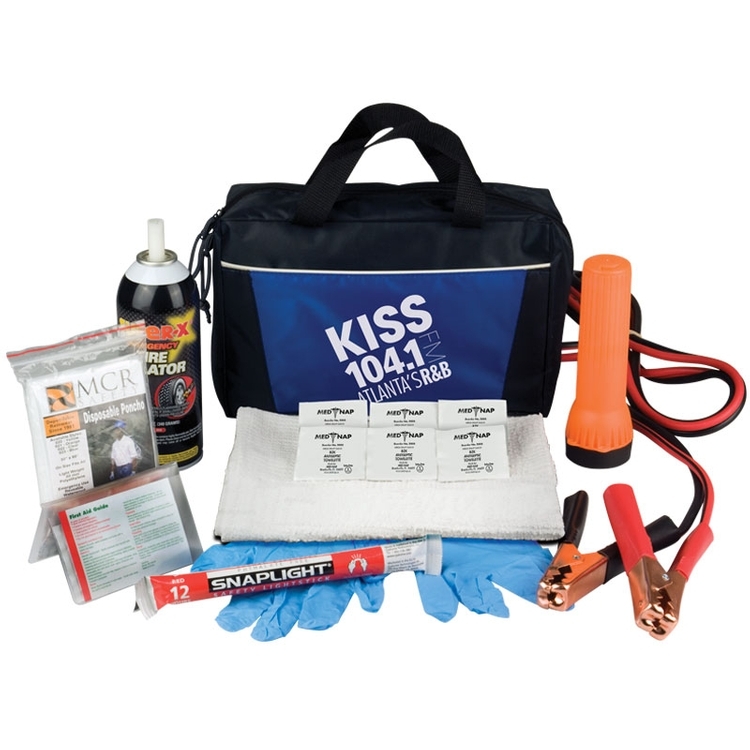 Hard plastic case contains Jumper Cables (8ft, 10 gauge, 200 amp), Flashlight with battery, Tire Inflator, emergency glowflare, distress flag, three wash-up towelettes* and pocket first aid kit (see FAV34A). 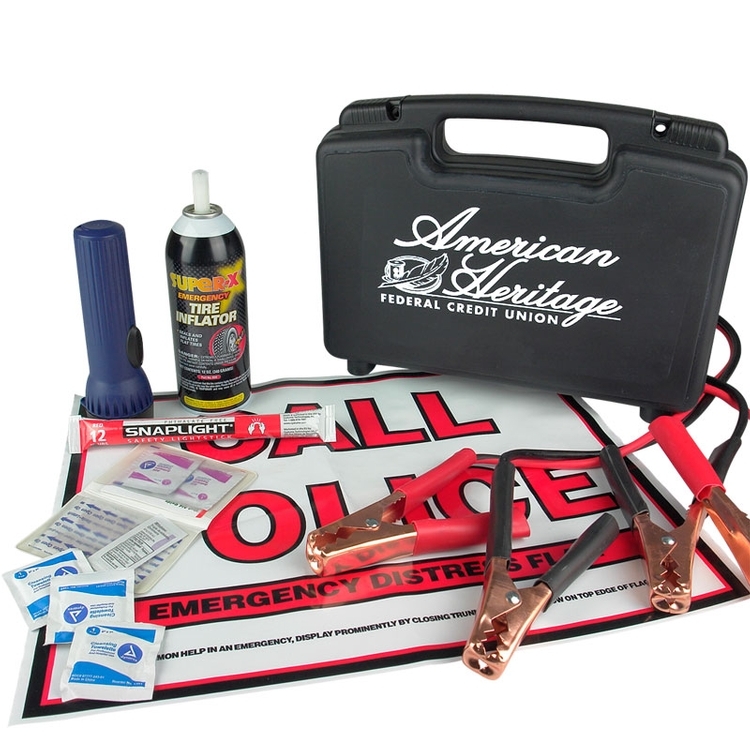 Premium Auto Emergency Kit. 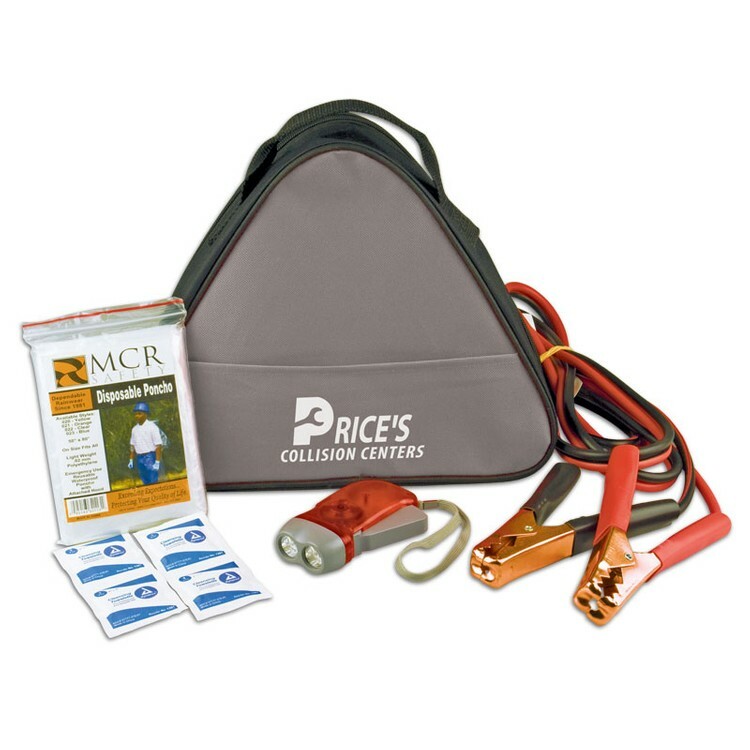 Premium polyester Zipper Tote with handle & front pocket includes Jumper Cables (8ft, 10 gauge, 200 amp), Flashlight with replaceable D battery, Tire Inflator, Glow Flare, Rain Poncho, Six Wash-up Towelettes, One pair of nitrile Gloves, Shop Cloth, and 19 piece first aid kit. 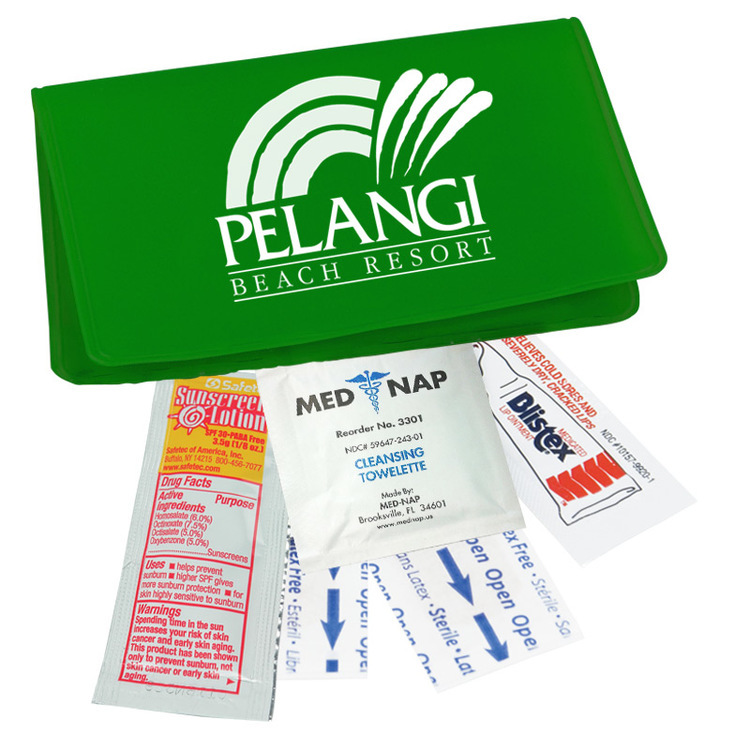 Contains two bandages wash-up towelette one sunscreen packets and one Blistex. Price includes one color imprint one side imprint. 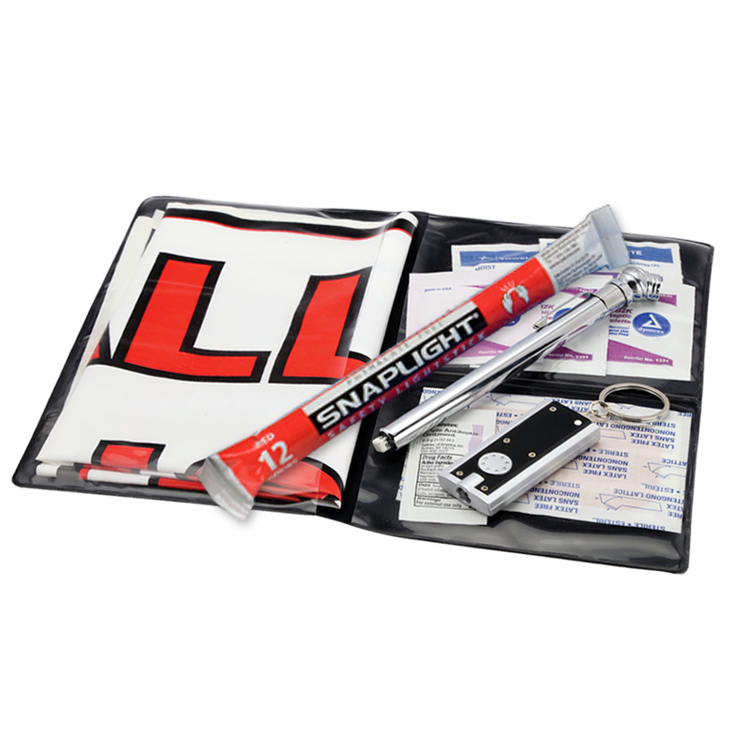 See how far your brand can go with the Journey Pocket Knife with N-Dome (TM)! This instrument is a five-function pocket knife quality-crafted from stainless steel and impact-resistant polymers. It's useful and compact. This pocket knife contains scissors, a small blade, a fingernail file, a toothpick and tweezers. The full color N-Dome (TM) decoration provides incredible color and a great price. It measures 2 5/16" x 3/4". 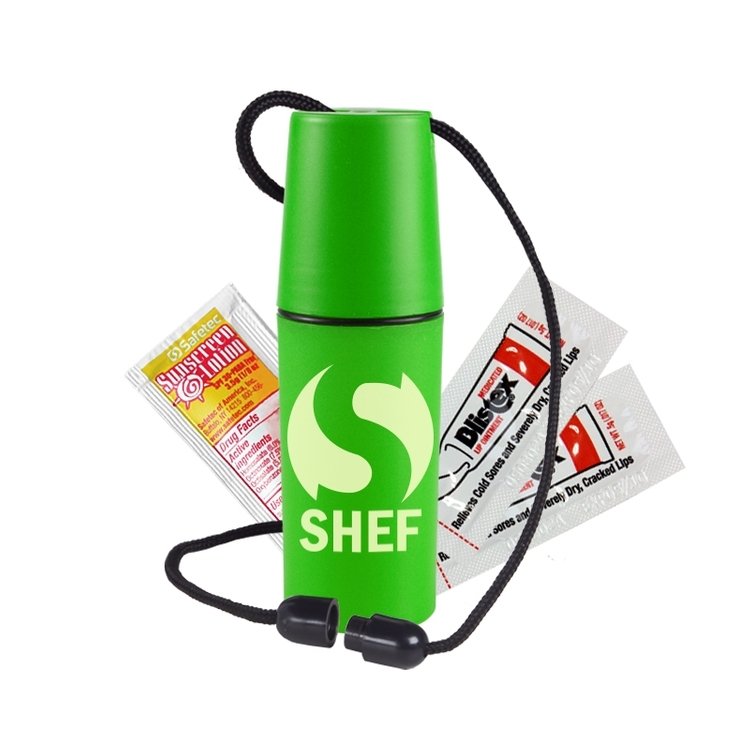 See how much of a punch this little promo product really packs! 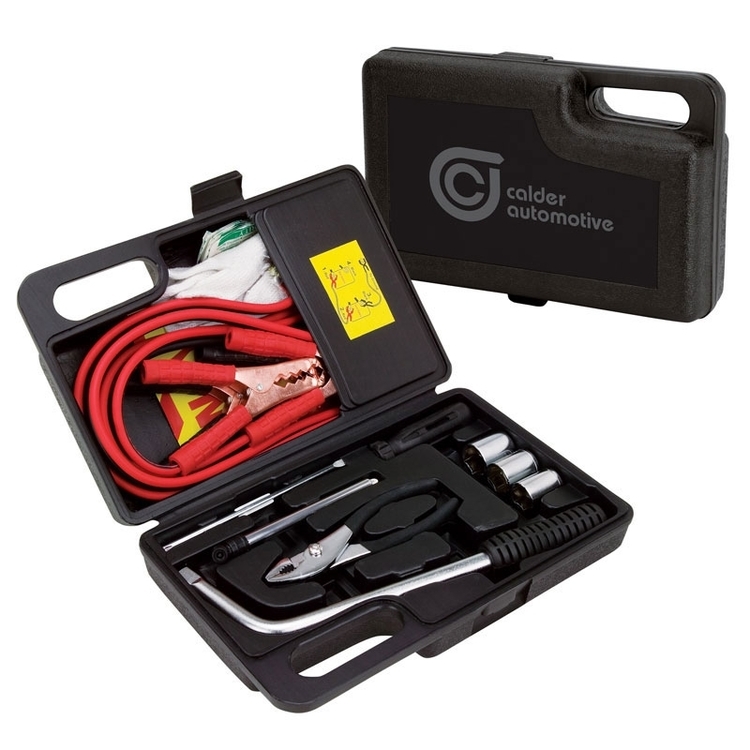 zip ties and a breaker bar with three large sockets in a sturdy black ABS plastic case. 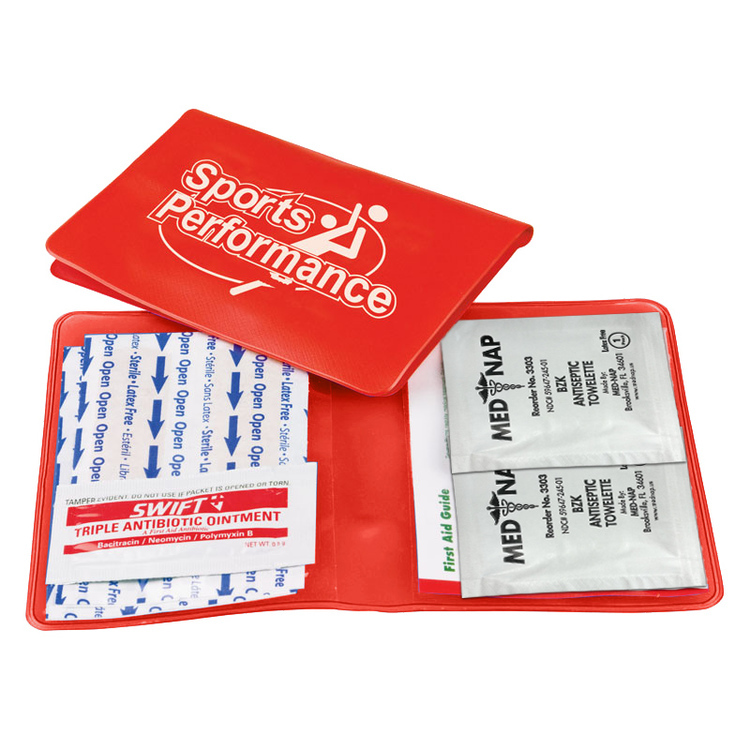 Contains sixteen latex-free adhesive bandages ten latex-free junior bandages nine antiseptic towelettes 1/2 oz. 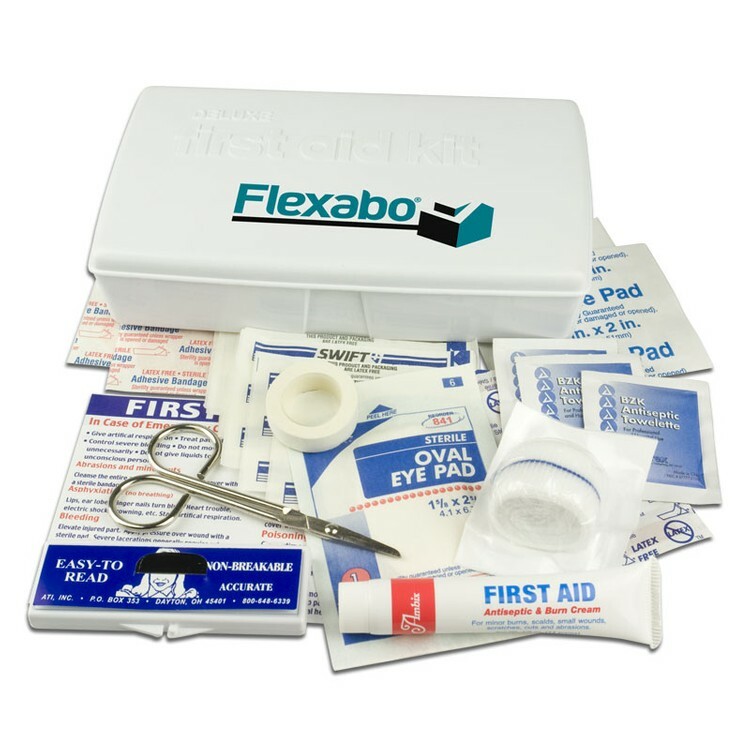 tube first aid cream 1 x 4 1/2 yd. 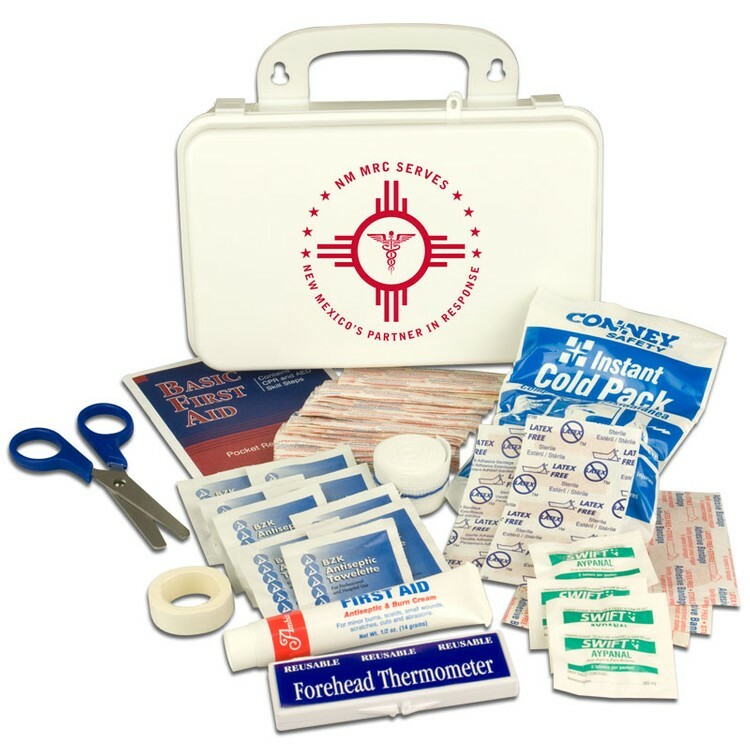 conform bandage two gauze pads two extra large latex-free bandages eye pad tape forehead thermometer scissors and first aid guide." Modern contoured design with living hinge and snap tight clasp. 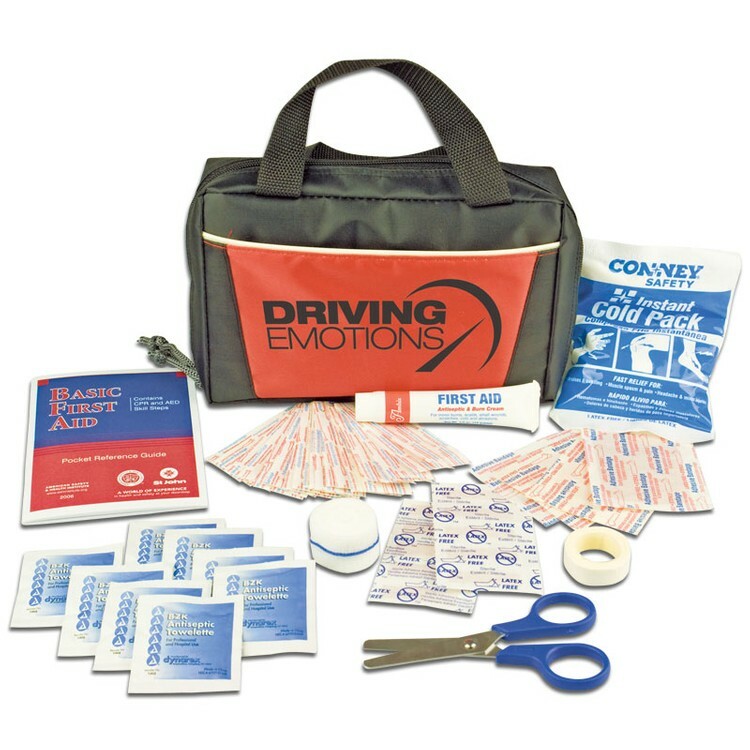 - Contains: twelve adhesive bandages six antiseptic towelettes 1/2 oz. 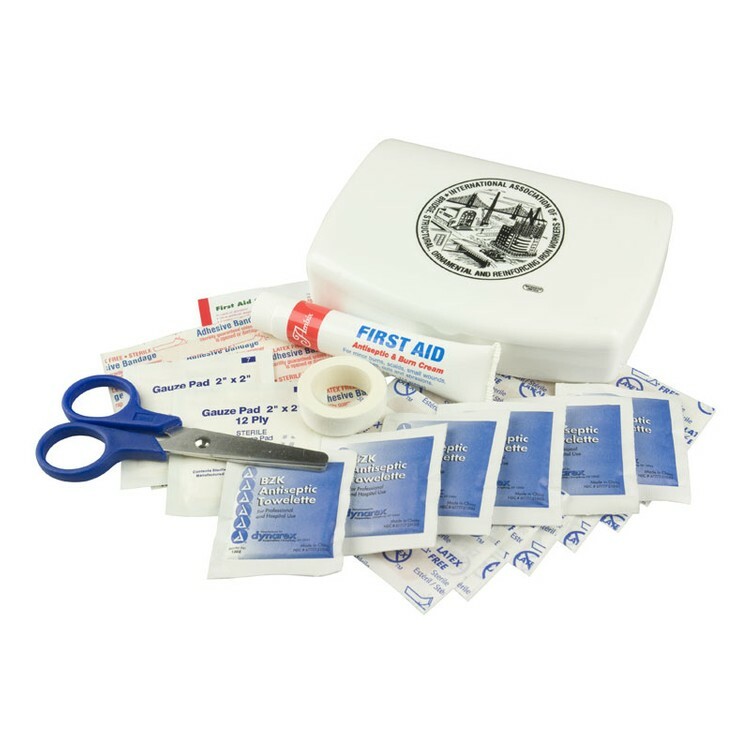 tube of first aid cream two 2" gauze pads two extra large bandages tape scissors and a first aid card. 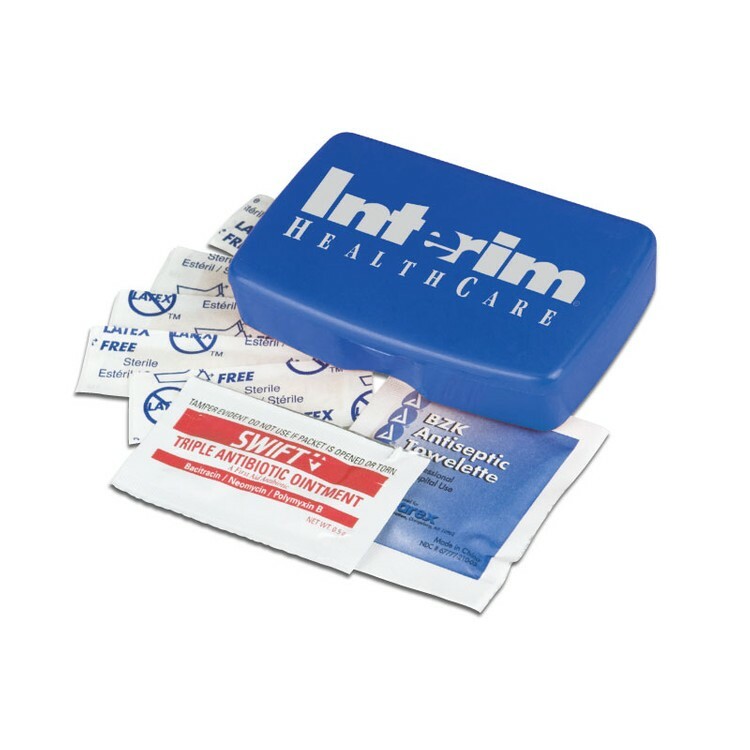 Contoured living hinge case - Contains: five junior bandages, triple antibiotic ointment and antiseptic towelette. Price includes one color imp. 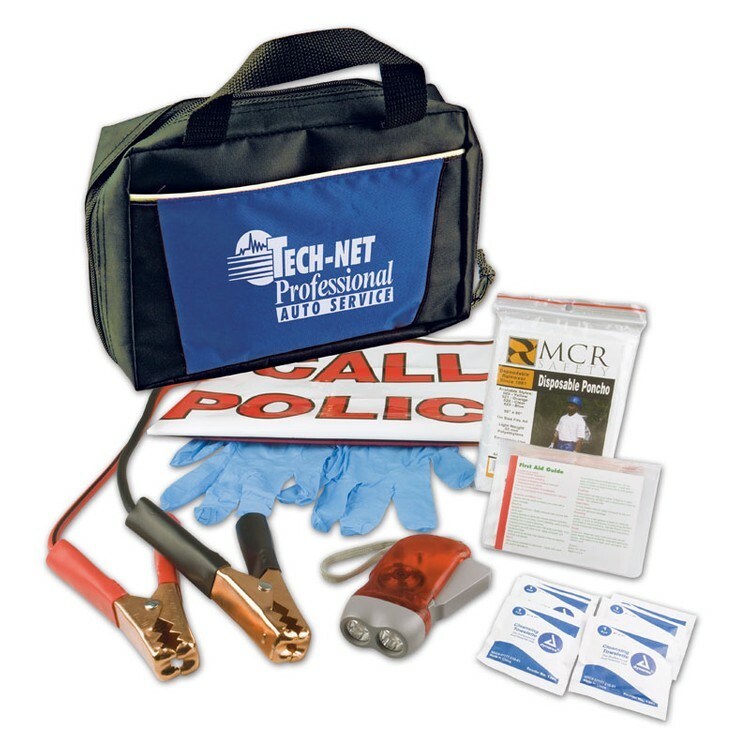 Premium polyester Zipper Tote with handle & front pocket includes Jumper Cables (8ft, 10 gauge, 200 amp), Hand-powered Flashlight (FL4CR), Rain Poncho, Distress Flag, Six Wash-up Towelettes, One pair of nitrile Gloves and 19 piece first aid kit. 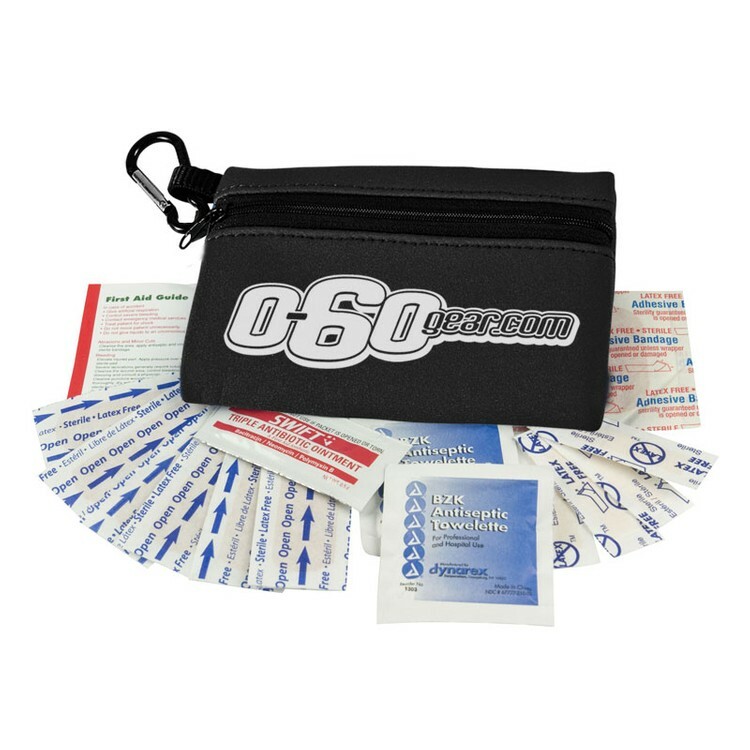 600D zippered case contains twenty-four latex-free adhesive bandages, ten latex-free junior bandages, four latex-free extra large bandages, nine antiseptic towelettes, 1/2 oz. 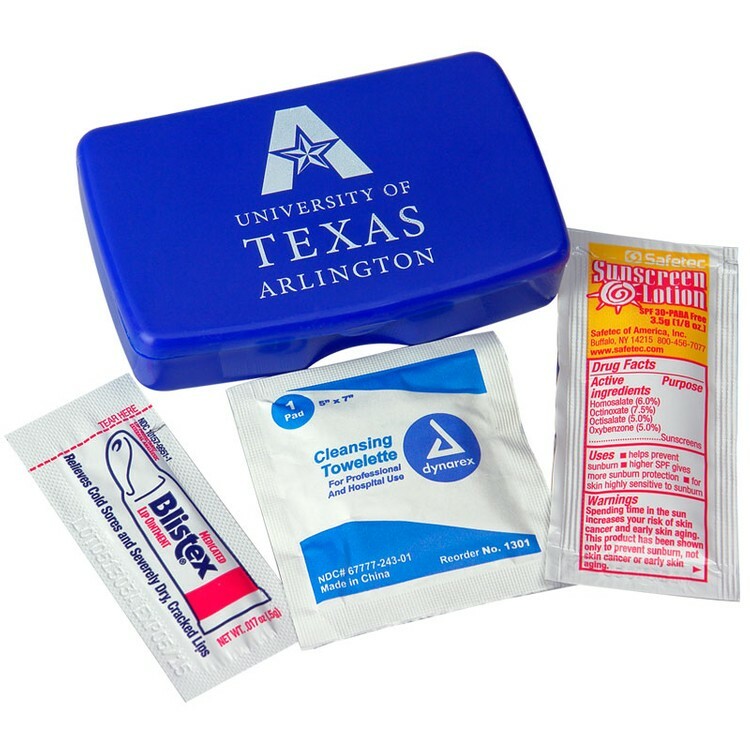 tube first aid cream, tape, scissors*, instant cold pack, 1" x 4 1/2 yrd. conform bandage and a 40 page first aid booklet. Price includes 1 color imprint on bag pocket. 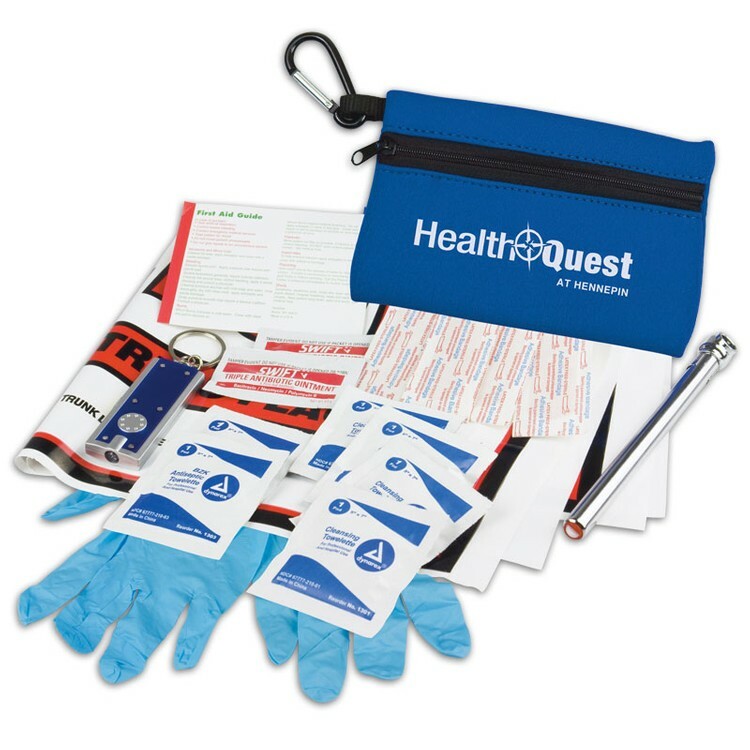 Phthalate-compliant Vinyl case contains penlight, distress flag, two wash-up towelettes, four adhesive bandages, three antiseptic towelettes, extra large bandage, triple antibiotic ointment and a first aid guide.